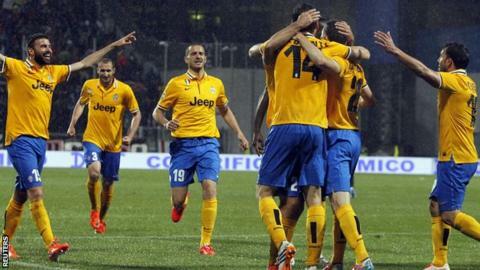 Juventus are on the cusp of clinching a third successive Serie A title after they came from behind to beat Sassuolo. Simone Zaza beat Gianluigi Buffon at the near post to give the hosts the lead but Carlos Tevez's deflected finish levelled matters. Claudio Marchisio made it 2-1 with a fierce drive before Fernando Llorente's backheel sealed the win. Juventus are eight points clear of second-placed Roma with three games remaining. The two sides face each other in the penultimate game of the season but Juventus need just two more points and could secure the title when they host Atalanta at home on Monday. They could already be champions by then if Roma do not beat Catania the previous day. Juventus coach Antonio Conte was looking for a positive response from his players in this game after their 2-1 defeat by Benfica in their Europa League semi-final first leg fixture last week. However, they fell behind when Nicola Sansone raced away before feeding a pass to Zaza, whose deflected shot got the better of Buffon. Juventus levelled 10 minutes before the break when Tevez received a pass from Marchisio outside the area and his powerfully struck shot struck Alessandro Longhi to deflect into the net. From then on, the visitors were in control and Andrea Pirlo's chipped pass over the defence allowed Marchisio to put Juventus ahead. Llorente's clever finish from close range late on ensured they took the three points before the full-time whistle was greeted by wild celebrations from the Juventus players and Conte. "We have taken a very important step toward a historic third title. "We are having a super season. I hear talk about an out-of-this-world Roma side but we are eight points ahead of them and in the Europa League semi-finals. So find adjectives for us. "It wasn't a title celebration at the end because there is still a chance for our pursuers. We have to seal it in the next match, I don't like anticipating things but we took a huge step forward." Match ends, Sassuolo 1, Juventus 3. Second Half ends, Sassuolo 1, Juventus 3. Foul by Sergio Floccari (Sassuolo). Attempt missed. Antonio Floro Flores (Sassuolo) right footed shot from outside the box is close, but misses to the right. Assisted by Luca Antei. Matteo Brighi (Sassuolo) wins a free kick in the defensive half. Offside, Juventus. Claudio Marchisio tries a through ball, but Fernando Llorente is caught offside. Offside, Juventus. Andrea Barzagli tries a through ball, but Fernando Llorente is caught offside. Delay in match Stephan Lichtsteiner (Juventus) because of an injury. Foul by Antonio Floro Flores (Sassuolo). Attempt missed. Carlos Tévez (Juventus) right footed shot from the centre of the box is high and wide to the right. Assisted by Giorgio Chiellini. Corner, Juventus. Conceded by Francesco Magnanelli. Foul by Luca Antei (Sassuolo). Offside, Sassuolo. Paolo Cannavaro tries a through ball, but Sergio Floccari is caught offside. Foul by Gaetano Masucci (Sassuolo). Substitution, Sassuolo. Gaetano Masucci replaces Nicola Sansone. Offside, Sassuolo. Alessandro Longhi tries a through ball, but Simone Zaza is caught offside. Attempt missed. Nicola Sansone (Sassuolo) right footed shot from the left side of the box is high and wide to the right. Assisted by Francesco Magnanelli. Attempt saved. Sergio Floccari (Sassuolo) left footed shot from the right side of the box is saved in the centre of the goal. Assisted by Antonio Floro Flores. Substitution, Juventus. Arturo Vidal replaces Andrea Pirlo. Simone Zaza (Sassuolo) wins a free kick on the left wing. Substitution, Sassuolo. Matteo Brighi replaces Raman Chibsah because of an injury. Delay in match Raman Chibsah (Sassuolo) because of an injury. Goal! Sassuolo 1, Juventus 3. Fernando Llorente (Juventus) right footed shot from very close range to the centre of the goal. Assisted by Stephan Lichtsteiner with a cross.